Catherine is a 24-year-old author from the West of Ireland. She have a Bachelors Degree in Psychology and a Masters Degree in Literature & Publishing. She is represented by Claire Wilson of RCW. Catherine enjoys movies, books, travelling, the company of friends, running, and discussing ridiculous hypothetical situations that will never happen in real life. She is deeply suspicious of cats and ladybugs. Say hi to Catherine on Twitter @doyle_cat. 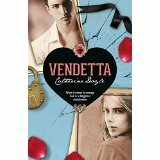 Vendetta is the first book of the Blood For Blood trilogy.